The exchange program is a program to support students to study abroad as a regular student, including but not limited to participating in a language course abroad. Therefore, students who want to participate in the program are highly recommended to make a decision about the desired university and the curriculum in consultation with their departmental advisor or the head of their department. Please note that graduate students must sufficiently discuss with their advisor or the head of their department before applying, on how to choose the advisor at the partner university and which laboratories to work in. Students must also take an official language exam in advance. Exchange students are selected every semester. Please refer to an announcement for the detailed schedule. The number of exchange students changes every year since the number of spots is decided after a discussion and review with the partner universities, on an annual basis. The specific number is confirmed immediately before the announcement for the call for application is made. Undergraduate students must have completed at least two semesters at Seoul National University. Graduate students must have completed at least one semester at Seoul National University. Those who have been selected for exchange program by the SNU OIA (both who have previously participated in the program and those were selected to participate but who have canceled the participation for whatever reasons). Those who are scheduled for military service. Applicants can apply to a total of three host universities in each application. Applicants must check the requirements of each university they want to apply to on their own. Please see the attachments or visit the websites of the universities. Applicants who meet the requirements (including academic performance, language score, etc.) are selected in the order of the overall GPA. Applicants must prepare the official language test scores for each university if you apply online. Applicants need to check the minimum scores required by universities. If you have recently taken a language exam but have not yet received the original score report, you are not eligible to apply for the program. 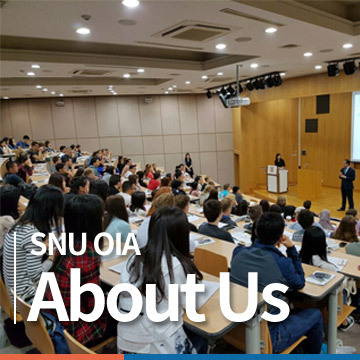 If you have been selected to participate in the exchange program to a certain area, then you cannot not apply for any other exchange programs to other areas through the SNU OIA.